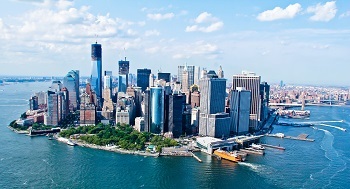 Monarch Air Group provides private air charter in New York, NY. Our clients benefit from top-notch service, unrelenting dedication to safety, wide selection of aircraft, and years of experience in chartering private jets. To obtain a free quote, please use our online quoting tool provided below, or call toll free 1-877-281-3051. Monarch Air Group is the private jet provider of choice for top corporate executives, government officials and jetsetters around the globe. For your next private jet charter to New York (TEB, HPN, FRG, JFK, LGA) allow us to select the ideal aircraft for your needs and budget and treat you to the VIP luxury experience you deserve. Through select joint venture agreements, Monarch Air Group provides access to thousands of well-maintained aircraft, from twin-engine turboprops to jumbo jets. Popular choices include the Cessna Citation X, the Gulfstream G650 and the Bombardier Learjet 60XR, but the options are truly endless. Once we select the ideal private jet for your next trip to NYC, we will then outfit it with an array of amenities to enhance your flight experience. Options include catering, Wi-Fi, massage chairs, digital entertainment systems, videoconferencing, outside mounted cameras and more. Whether you want to use your in-flight time to conduct business meetings and be productive, or to simply relax and enjoy the view with a flute of champagne, your wish is our command. Our personnel are carefully screened and highly qualified, with years of industry experience and in-depth knowledge that sets us apart from the competition. Our signature boots-on-the-ground approach and worldwide strategic presence have rewarded us with such demanding repeat clientele as the U.S. Department of Defense, United Nations and the World Food Programme. At Monarch, we take pride in exceeding industry standards in every arena, from pilot performance to aircraft maintenance to five-star customer service. Fly with confidence knowing that we are Wyvern and ARG/US certified and that our pilots have thousands of hours of flight experience. Our operators are standing by to assist you in booking your next private charter to NYC. Call us today for a free quote. ISP, Long Island Mac Arthur, Islip, NY, United States. Smyth TriBeCa – a Thompson Hotel, 85 West Broadway, New York. The Greenwich Hotel, 377 Greenwich Street, New York. Crosby Street Hotel, 79 Crosby Street, New York. Hotel on Rivington, 107 Rivington Street, New York. The Nolitan Hotel, 30 Kenmare Street, New York. Blue Moon Hotel, 100 Orchard Street, New York. N U Hotel, 85 Smith Street, Brooklyn. Best Western Bowery Hanbee Hotel, 231 Grand Street, New York City. Union Square Inn, 209 East 14th Street, New York. Millennium Hilton, 55 Church Street, New York.